Historians in Service of a Better South, new from NewSouth Books, has as its subtitle “Essays in Honor of Paul Gaston.” The book is a Festschrift, a collection of essays by Gaston’s students and colleagues over his long career at the University of Virginia and through his long-time involvement in civil rights causes. Robert Jefferson (Jeff) Norrell and Andrew Myers edited the book. Gaston joined the history department of the University of Virginia in 1957, teaching Southern and civil rights history until his retirement in 1997. His involvement in civil rights and social justice began with his role as a community organizer and participant in protest movements and sit-ins during the 1960s. At UVA he led student and faculty efforts to dismantle segregation. He served as research director of the Southern Regional Council; he was a member of the SRC’s executive committee from 1974-1998 and presidentfrom 1984-1988. Books by Paul Gaston include The New South Creed: A Study in Southern Mythmaking (winner of the Lillian Smith Book Award), Women of Fair Hope, Man and Mission: E. B. Gaston and the Origins of the Fairhope Single Tax Colony, and Coming of Age in Utopia: The Odyssey of an Idea, all published or returned to print by NewSouth Books. He also contributed essays to Where We Stand: Voices of Southern Dissent and Dixie Redux, itself a Festschrift to scholar Sheldon Hackney. 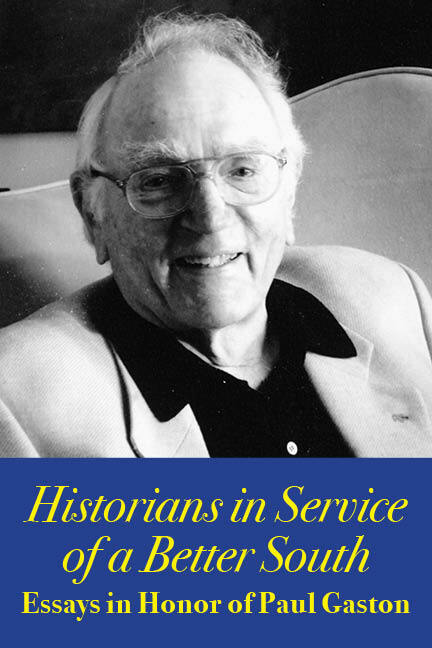 Contributors to Historians in Service of a Better South: Essays in Honor of Paul Gaston include Edward Ayers, Raymond Gavins, James Hershman, John T. Kneebone, Matthew Lassiter, Gregg Michel, Lynda J. Morgan, Stephen O’Neill, Robert Pratt, Steve Suitts, Randolph Werner, Myers, and Norrell. Historians in Service of a Better South: Essays in Honor of Paul Gaston is available from NewSouth Books or your favorite bookstore. You are currently browsing the NewSouth Books weblog archives for April, 2017.